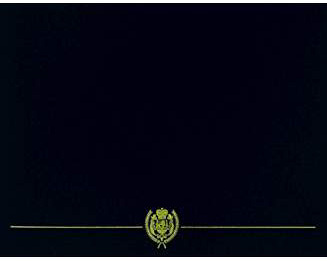 A photocopy of your DD-214 or ERB/FRB/ORB etc., displaying your Active, Reserve or National Guard occurring any time after 11 September 2001. 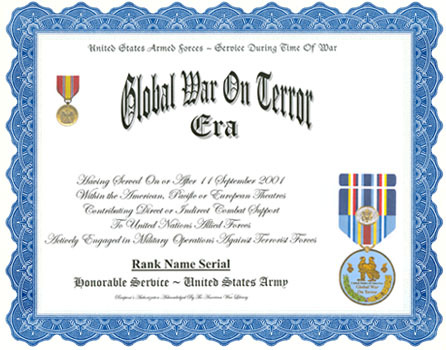 The Global War On Terror War Era Recognition is a commemorative authorized to military and civilian personnel of all nations for recognition of their service and support combatting international terrorism between 11 September 2001 and a terminal date to be announced upon Congressional Declaration ending the War On Terrorism. The proposed design for the Global War Era medal incorporates elements of the United States Global War On Terror War Service and Expeditionary Medals, The United States Armed Forces Medal, The United States National Defense Service Medal, and The American Campaign Medal. The East-West facing Eagle represents the dual-service contribution of military service in Global War On Terror, The United States or Europe confronting the global spread of Terrorism. Both Eagles riding atop and protecting the other's back respresents mutual support for safeguarding of the other's forces. No medal has yet been cast for this Military Service Recognition award. The medal's original design has been placed in the public domain.